Madame’s boudoir--it might be the bedroom, a dressing room, a large closet, a vanity table or just the bathroom sink. Wherever it is in your home, the decorations should reflect the pampering and preparation you have (or WISH you had) to face the world every day. 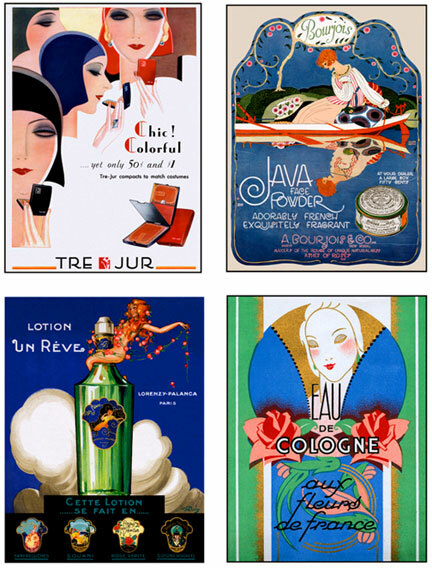 These fabulous posters recall an era long past, when American and French advertisements for perfume, body lotion and makeup were far more romantic and less blatant than today. They’ll look perfect in almost any boudoir. Each poster is printed on heavy weight paper, packed with a backer board and wrapped, ready for you to frame. Sized to fit a smaller area (each is 11” X 14”), hang one by itself or two next to each other.